AMY. Amy Vickers grew up in Hobart, with a love for the sea and a passion for people. Amy lives with her husband and family on the NSW south coast. She spends her free time on the water, by the beach or camping with three beautiful children; life is rarely dull. Amy has served for 21 years in the RAN, experiencing three operational deployments and is currently serving at HMAS Creswell as a Chief Petty Officer. During her service Amy was adversely affected by a number of aircraft crashes and a series of unique life events. Whilst life has been challenging at times, Amy has shifted her focus to become a practitioner of Neuro Linguistics Programming; helping people to them help themselves. Amy works as an executive coach for the Navy Leadership Coaching Program and is a facilitator/educator for the Sexual Misconduct Prevention Program. Amy was a participant on the Trojan’s Trek SA women’s pilot program in 2014, returning in 2015 and 16 as a mentor. She is a strong believer in the Trojan’s Trek philosophy of condition self-management which she finds helpful in her daily life and is grateful for the support that the Trojan’s Trek community has given her in life’s tough times. As the lead facilitator for the pilot 2017 QLD women’s trek, Amy is looking forward to meeting other female trekkers and to help grow the trek family. ANNA. Anna Sutcliffe is Victorian; a spirited child with an eye for the bush, mountains and animals. From the age of 6, Anna with her family was horse riding and droving cattle on the Hay Pains and beyond. During her 18 year army career Anna reached the rank of sergeant. She experienced multiple postings within the Townsville area and was also posted to Kapooka and Hobart as a Defence Force Recruiter. In addition Anna spent two years in the Army Reserve as a sergeant. Anna has operationally deployed twice to East Timor on INTERFET and UNMISET. Post service, Anna’s priority has been the support of women veterans suffering with mental health issues similar to her own which resulted from military service. 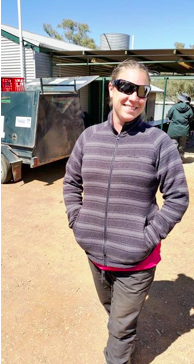 She was involved in the design of the first Trojan’s Trek women’s pilot program held in the Flinders Ranges in 2014 and has retained a hands-on role since. The women’s program is designed to give women a voice in the modern veteran community and help validate their experiences and recognise the sacrifices made by servicewomen. Anna knows that life isn’t without its challenges but it’s the path chosen which makes the difference. To her and to past participants that difference has been amazing and is a result of the Trojan’s Trek program and the sister network.